The acclaimed and outstanding Ferrari GT series is back on your mobile device. Buy and drive 57 authentic Ferrari models including the 250 Testa Rossa, the Ferrari FF and the SA Aperta. Race through 10 locations around the world like Sydney, Hong Kong and the Ferrari Fiorano test track and enjoy dozens of thrilling challenges. 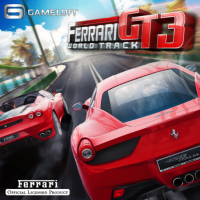 Avoid obstacles, overcome competitors, perform amazing drifts and more! Play your dream. Drive a Ferrari.